Time to focus on you and your needs and priorities? Like some support as you step forward, reclaim your courage and let go blockages that are holding you back in a safe and supportive environment? Have a passion for the truth and are ready to live your dream career and life? If you answered yes to any of these questions, why not join us for Reconnect! Whole-Hearted Academy for Women is a safe and supportive online learning community for women who are ready to invest time and attention to reconnect with themselves, so they can make empowering choices, focus on what matters most to them and create a whole-hearted life with the support of ongoing personal and professional (un)learning. How Does Whole-Hearted Academy for Women Work? Reconnect is outlined on the following page. 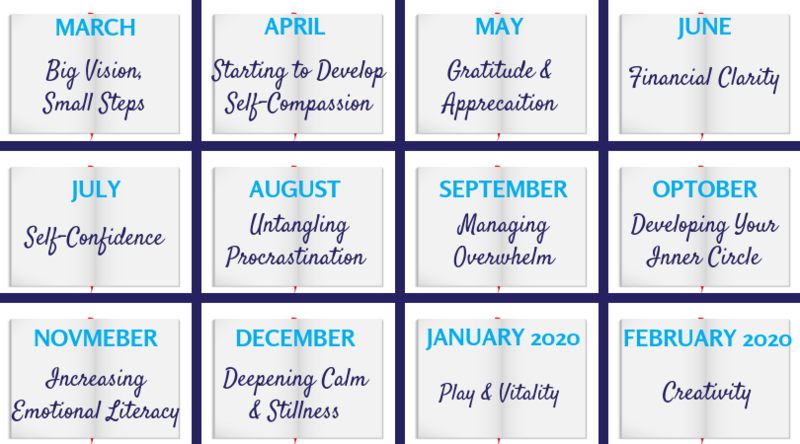 However as a guide, each month you are a member of Whole-Hearted you have the opportunity to take time out to align with what matters to you, learn to like and trust your self. The first Masterclass will start on Saturday March 2, 2019 @ 11am QLD Time. Support from Jane in the online community. What Are the Benefits of Whole-Hearted Academy for Women? Encouragement and Support - you will have encouragement from other members. When was the last time someone gave you genuine support and celebrated your successes? In Small Steps, we want to celebrate with you and share your successes, no matter how big or small they may seem! Who is Whole-Hearted Academy for Women is for? are ready to keep growing and learning to continue to take your personal and professional life to the next level! Basically, Whole-Hearted is about you coming home to yourself, showing up for you for at least three hours per month. What are other People Saying about the Habits for Wellbeing Online Communities? "Thank you Jane for putting so much effort into helping us help ourselves... sometimes we need a not so gentle nudge and reminder that we are as important as the people we love, care for, worry about and help.. AND if we don't put ourselves into the beginning of the equation in our thoughts and action, things can get really messed up... plus it's exhausting 'being there' for everyone, when we aren't there for ourselves... looking forward to the next chapter of the journey." - GT. Great - it will be wonderful to have you in the community. You can join for $20 per month, 12 months for $197 (2 months free). Just click on the buttons below to get started! You can read more about the online learning community here or contact us here.